As today’s children are practically born digital, it comes as no surprise that this generation is the most tech-savvy yet. Now, with more than half of all US children having access to a mobile device- such as a smartphone, video iPods, or tablet, these gadgets are bridging the gap between entertainment and learning and between adult and child. In its Play Lab, Fisher-Price found 6-month-olds batting at iPhone screens, 9-month-olds swiping, and 12-month-olds pointing out objects and recognizing the location and function of the home button. Together with insights on translating traditional engaging play onto on-screen apps, Fisher-Price toy producers and industrial designers developed its category-defining Apptivity line of toys and apps. 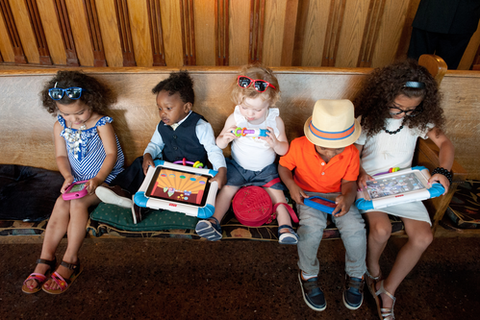 This session will tap various industry experts to discuss the hot topic of toddlers and tech—the social permanence of technology, how young children engage with technology, the link between play and learning, and the guardrails for technology in play. Maryam Scoble is an independent conference and event planner who has been passionately planning conferences since 1995. She has even spoken at a few of these herself. Most recently she has been working with Parnassus Group on managing tweethouse events across the country. She is married to tech blogger Robert Scoble and is the proud step-mom to the teenager Patrick Scoble and mom to two feisty and tech-loving toddlers, Milan (5) and Ryan (3). As Director of Product Design at Fisher-Price, Tony Favorito focuses on Preschool Technology Play, Role Play, Doodle Bear Toys, and Licensed Basic Toys and is responsible for the User Experience Team.